23001 Del Lago Drive Suite B2, Laguna Hills, CA 92653 (view map). *There are no Group Classes at 5pm or 6pm; instead we will run heats to perform the CrossFit Open WOD 19.1 as part of our 1st Annual Intramural. More details can be found here. NEW TO CROSSFIT? Email or call us to schedule an introductory session today! DROP-INS are always welcome! Give us a call or email us and let us know you’re coming! If you’d like to fill out your waiver ahead of time, simply click here. Our drop-in rates are $20/class, $50/week or we offer a 10-class punch card for $180. We do not offer Open Gym only to drop-ins. GROUP CLASS is our standard 1-hour CrossFit class. NationFit is a 45-minute boot camp focusing on getting fit, tone and sweating your booty off! 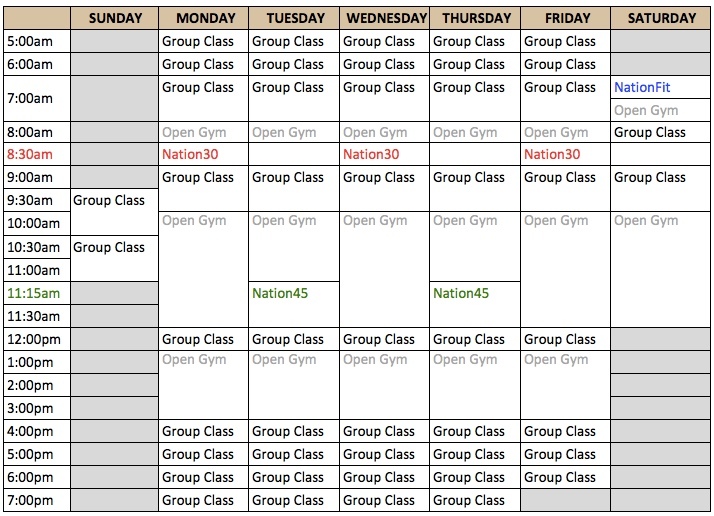 Nation30 is a 30 minute CrossFit class designed to get you in and get you out quickly without sacrificing work capacity! Each class will feature a quick 5-10 minute warmup then it’s time to 3…2…1…GO! The focus of the movements will be on conditioning and intensity. Nation45 is a 45 minute CrossFit class for those who want to get in a workout during their lunch break. Each class will consist of a warm up, a quick strength piece and then a 20 minute workout. The focus will be on building and maintaining strength with squats and presses then keeping in shape with a workout to get you breathing hard. OPEN GYM is available between classes. Open Gym is not available for those with a limited membership, punchcards or drop-ins. CHILDCARE is offered either supervised during certain classes or we have a children’s room where they can hang out unsupervised if they’re old enough. Sign up for child care online here! Please email info@ruinationcrossfit.com to find out more details.